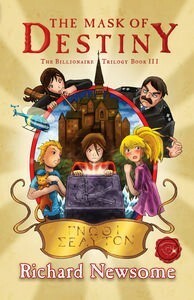 The 'Billionaire Trilogy', began with The Billionaire's Curse, which won the Text prize for Young Adult and Children's Writing in 2008. The second book, The Emerald Casket, was published in 2010. This third and final installment in the series, reunites readers with Gerald, Ruby and Sam and follows them on their quest to uncover the mystery of Gerald's inheritance. The story starts in London, where Gerald soon becomes framed for the murder of his arch-enemy Sir Mason Green. He escapes with Sam and Ruby and, with their help, attempts to clear his name by finding the third casket. The search leads the three children to Mont Sant Michele, Paris, Rome and finally Delphi, all while pursued by the police. Charlotte, Sir Green's evil niece and chemist extraordinaire, is also searching for the casket. Gerald and his friends must find it before she does. While Gerald and his friends perform amazing feats, like swimming into dark caves with skeletons and escaping police in Paris on hire bicycles, they still squabble over who smells the most after not having a shower. The fact that they behave like normal kids makes them easier to relate to and increases the strength of the whole story. What most stands out about the story is its rapid pace. The narrative moves along at such a rate that the reader almost becomes breathless trying to keep up. The locations are exotic, further enhancing the fantastical elements of the tale. The twist just before the end keeps the reader guessing right until the dramatic conclusion. The Mask of Destiny should appeal to readers aged ten and upwards.